Tomorrow is our last day of preschool. That means that summer vacation officially starts for my family. Some of you have already left the school year behind and are experiencing the joys of summer. With all that summer brings - picnics, playing at the park, running in the sprinklers, it also brings with it a lack of routine and therefore, a later bedtime. Around our neighborhood it is not unusual for the kids to play until dark, running from house to house, playing tag, riding bikes or shooting baskets. For some reason the lack of an official bedtime in the summer makes me a little anxious. I try to keep my kids on some sort of schedule, but it just seems mean of me to make them come in while everyone else is hanging out having fun. And, if you have younger children as I do (5 yrs.) you know that a later to bed does not necessarily mean later to rise. So how much sleep do kids really need? 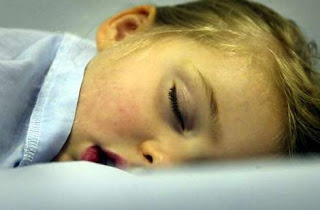 According to WebMD.com, kids between the ages of 3 and 6 need 10 1/2 to 12 hours of sleep a night. This means going to bed between 7 and 9 p.m. and waking between 6 and 8 a.m. That sounds about right to me. Children up to the age of 12 need at least 10 hours of sleep per night. So, although the freedom and fun of summer are a nice break, try not to lose track of the importance of bedtime. I know I won't. And they are just better behaved! I agree with that - kids need their sleep! My high school daughter calls me the 'sleep nazi' because I really try hard to make sure my kids get adequate sleep. Without it, mood and behavior really declines. Now that I think about it, I am sure I got my slight bedtime obsession from my mother. I actually had a 9pm bedtime (during the week) through high school. I think a solid bedtime benefits both children and parents. We need a little downtime at that hour as well. Very good information. Now what about my high school graduates? I really can't tell them bedtimes anymore. One thing I can do is say the computer and TV cease to exist after a certain point each night.